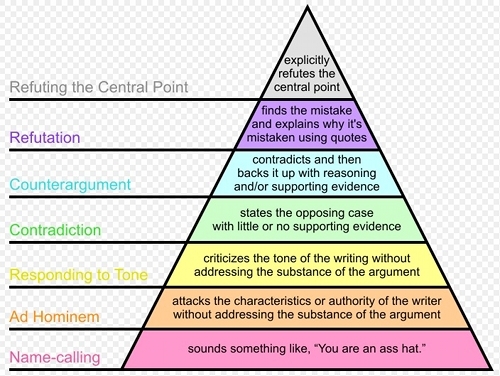 I have worked with colleagues who love to debate and get quite heated in their arguments. The only problem is that I’ve never heard anyone actually win in a heated argument. This is because even if one person is clearly right, each person will dig their heals in deeper as the argument goes on. In fact, listening to people debate clearly shows that both parties are more convinced that they are right than before they actually started the argument. Can you think of a time when you were absolutely right and you had evidence to prove it? This happened to me once when I said at a place where used to work at that I happened to find out that you can hypnotise a chicken by putting its beak on a line. Afterwhich, it is said that the chicken will freeze and not be able to move for some time. However, when I mentioned this, all of my office colleagues got together and decided that this had to be nonsense. I found out that a few days later a few of the people who disagreed with me met up with another employee in the canteen from a different department, this person grew up on a farm and verified that hypnotising chickens by putting their beaks on a line was actually true, and that he and his brother when they were young had tried it with some success. Nobody mentioned that they had found out that my argument was actually correct of course, so I decided to bring it up. There was a hateful silence and a few narrowed eyes looking my way. Everyone hated me at that moment and the bad feeling didn’t disappear until a few days later. So, even though I proved that I was correct, I hadn’t won the argument as what did I gain out of it? Absolutely nothing. Granted, some people would get a heightened sense of importance after proving others wrong, but it doesn’t do anything for me personally. It doesn’t float my boat at all. I just wounded my colleagues egos and created tension in the workplace. I realised that I wasn’t entirely without fault in the argument, as I should have listened an d accepted that people couldn’t believe the chicken fact and moved on to talking about other subjects. Things are never black and white and instead are usually grey, as in it might be harder that it sounds to hypnotise chickens by putting their beaks on a line. I imagine it probably would be. I made things worse in fact, because I remember being in conversation with the people working in the same office as me and remarking that I’d never seen a bird die. I’ve seen more dead human bodies than I have birds dropping dead and falling to the ground from telephone wires. Unless a bird is hit by a car or flies into a pain of glass, I can’t recall a time when I’ve seen a bird lying around after it’s died naturally. How many times have you said “Oh no there is a bird that has dropped dead in the garden again.” Not unless a cat has attacked it of course. Anyway, the whole office erupted with laughter and everyone rallied together and said that the question of “Where do birds go to die?” was the dumbest question they had ever heard. This reaction seemed to vent their anger at me wounding everyone’s sense of pride by proving everyone wrong about the hypnotising chickens saga. Now, I should have left it like that and laughed along with them, but I decided for a laugh to send the question off to a scientific magazine. I did this for a joke but the question was accepted and the topic was featured in the magazine. The explanation was that people just don’t notice birds dying and road sweepers and critters dispose of the dead birds pretty quickly. I brought in the scientific magazine into work and assumed that people would find the fact that the question had been pondered upon by the scientific community hilariously funny. It had the opposite effect though; it made matters worse. The atmosphere in the office I was working at was made worse by my insistance to stand my ground and argue or validate points. The very next week I was ill and rang in sick. Then I found out that a few people in the office had sarcastically remarked that I hadn’t looked that ill the day before my sick leave. I was upset by this remark, understandably, but again I made the mistake of trying to ‘even theÂ books’ as it were in reply to this backstabbing . . . The week after that I took a day’s leave off, that I intended to take anyway, and I arranged this with the manager privately. I didn’t tell anyone in the office that I’d taken this day off. Then the morning of my day off I rang the office, as I knew that the manager wouldn’t be in for at least another two hours. One of my work colleagues answered the phone and I said that I wouldn’t be in that day, she asked why and I gave the fictitouos reason of having an emergency situation arrise with my pet hamster. I said that I was hoovering and accidentally hoovered up the hamster so I couldn’t make it in. This particular work colleague asked why I hadn’t released the hamster from the hoover, so I said that I had to call out a hoover repair professional as I didn’t have the right tools for dismantling the hoover as it was ‘super technical’. 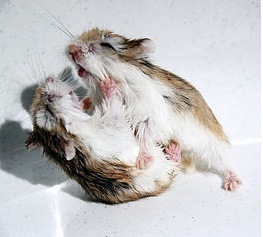 After this telephone conversation, all hell broke loose in the office and I heard on the grape vine that several work colleagues approached the manager with their outrage about the fact that I couldn’t make it in because of a hamster. The manager laughed this off and informed them that I’d already booked the day off in advance. There was bad feeling resulting from this saga for months afterwards, with no one even saying “Good morning” when I came into work for a while. Heated Arguments Just Make The Other Person More Resolute. Okay, I admit that I was rolling around the floor laughing at the hamster incident and the resulting chaos, but what did I really gain out of it? After all, I just built up more and more resentment and became probably the most hated person in my office for a while. The sensible thing for me to have done in hindsight was to keep quiet and accept that some people have a different opinion. Going back to the hypnotising chickens situation that sparked off all the other disagreements – I should have listened to objections, asked why people thought it must be untrue and then asked them for their help in finding out the real facts. This way my work colleagues would have saved face and I would have acknowledged other people’s worth by trusting them with researching whether the fact was true or not. Everyone would have been happy if I had controlled my emotions more. Now I’m determined to listen to the other person’s point of view and consider their opinion carefully, even if I disagree. I get a lot more out of communicating with people by not jumping the gun and throwing myself into an argument. Does it really matter if you think someone is wrong or not anyhow? Dinosaur Fossils Appearing All Over The Planet, With The Sole Purpose Of Testing My Faith. When I was very young I attended a Christian school and at that time I loved reading about dinosaurs and looking at pictures of fossils. One day, I stuck my hand up in class and innocently asked, “How come dinosaur fossils are millions of years old, but God made the Earth only 4000 years ago?” The teacher, instead of taking me to one side and helping me with my confusion began to shout at me in front of the whole class. His angry reply was “Kevin! God put the fossils there to test your faith! Can you not see that! ?” As you can guess, his reaction didn’t exactly help me in finding a spiritual path or a religion to follow. If I asked that question now I wouldn’t blame anyone for thinking that I was being argumentative, but I was only 7 years old and genuinely wanted to clear up the confusion I felt. The fact remains that I’ve never heard anyone in a heated argument admit that they were wrong and probably never will do either. Conversely, when someone is calm, considers the other person’s view, and discusses a topic in a light-heartedÂ and happy way, people are more inclined to look at both sides of the argument. As a closing thought, if I met a creationist today who wanted to explain to me that Earth and the universe are in fact only 4000 years old, I would contain my confusion and try to just listen. I would even go on a tour with them around a creationist museum and have a coffee. Practising listening to other people’s point of view instead of concentrating on how I can change that person’s mind or how wrong or right I might think they are.